The tasty and nutritious way to add sizzle to your breakfast, veggie burgers and BLTs, these vegan strips are ready in just 3-4 minutes on the skillet or 5 minutes in the oven, making for a great breakfast side dish or a complement to your favorite sandwiches. Each 5 oz. (142g) package contains 14 vegan bacon strips. $5.49 per package. Kosher. Ingredients: Water, soy protein isolate, vital wheat gluten, soybean oil, soy protein concentrate, textured wheat gluten, less than 2% of: salt, sugar, carrageenan, natural flavor (from plant sources), nautral smoke flavor, spices, fermented rice flour, oleoresin paprika (color), potassium chloride. From Meredith Meeks of Great Falls, Virginia on 1/18/2018 . 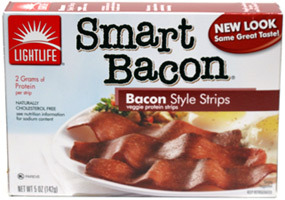 I have bought dozens of these boxes of lightlife smart bacon over the years. Although I've tried many other brands on the market, this product continues to be the best vegan bacon out there. I like my bacon crunchy and not greasy, so I bake these in the oven and do not add oil - for a different texture, cook them with oil on the stovetop. From Anonymous of Martinsville , Indiana on 11/5/2017 . Wow!! Even if I were still eating corpses of slaughtered pigs, I’d eat this “bacon” instead!! It’s non greasy & cooks without filling the house with the “smell/stench” ... 20 calories per slice... arteries not clogging.... digestive system happy... what’s not to love ?? Wonderful bacon!! Look forward to other products from this company. From Anonymous of Cleveland, Ohio on 12/14/2015 . So far, these are my favorite meatless bacon strips. I've tried a few other brands, and they just don't cook as nicely as these. I just put a little bit of olive oil in a pan and cook them for about 3-4 minutes per side,until desired crispness. They will cook up very crispy if you want them to, which I always do, since I'm usually using them on vegan egg sandwiches or blt's, so you want the crisp. I agree they are a bit hard to pull apart...they could work on that aspect, because it is a bit frustrating, but the product itself is a winner! From Matt of Taunton, Massachusetts on 11/20/2015 . From Anonymous of Rancho cucamonga, California on 8/28/2015 . Pretty close on taste and texture to real bacon. My mom, who recently went vegetarian also liked it. The texture makes it more "authentic" then their tempeh bacon which is also really good. Allergens This item is manufactured in a facility that also processes soy and wheat.